Thyme is an evergreen herb with culinary, medicinal and ornamental uses. The most common variety is Thymus vulgaris. Thyme is of the genusThymus and a relative of the Oregano genusOriganum. It belongs to the family of Lamiaceae Habitat. It is one of the incredible herbs found in nature that has a fund of antioxidants and capable of treating a host of diseases. It’s leaves also act as an excellent skin antiseptic and as a tonic for your heart system. The benefits of thyme oil have been recognized for thousands of years. Let’s see some of the amazing health benefits of thyme herb here on this page. It contains one of the strongest antioxidants known to man, and it is proved to have killed about 98% of breast cancer cells. 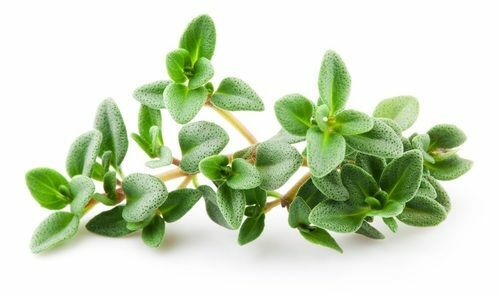 The medicinal properties of thyme come mainly from its essential oils which are extracted through steam distillation of fresh flowers and leaves. Anticarcinogenic: Thyme is considered a wonderful anticarcinogenic. In a study, it was seen that in vitro breast cancer treatment, thyme essential oil was able to kill 98% breast cancer cells in less than 72 hours. Thyme is known to be effective all types of skin ailments, including eczema. Thyme essential oil fungal cream can be used for all types of dermatological problems. Yeast Infections: One of the benefits of Thyme essential oil is that it is extremely effective against all types of yeast infections. Thyme essential oil is a good antiseptic and protects the wounds from infections. Thyme essential oil also tones up the circulatory system, heart, digestive system, nervous system, muscles, and skin while boosting up your immunity.